Major landmarks: The old Divisoria Wet Market (now turned into a parking lot) at the end of street near L. Chacon St.; Fiesta Shopping Plaza and KP Tower Commercial Center at the corner of Juan Luna St. and C.M. 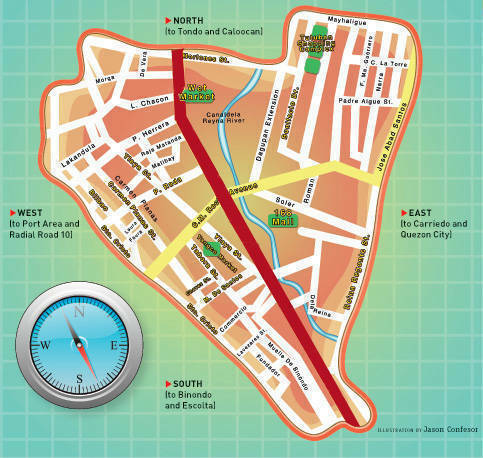 Recto Ave.; Juan Luna Bridge near Ylaya and Tabora streets; and Juan Luna Plaza at La Chambre St. surrounded by Canal dela Reyna estero. Goods in stores: A glut of in-store shops sell an assortment of textiles, ready to- wear clothes, shoes, bags and accessories, packaging supplies, stuffed toys, fishing supplies, kitchen wares, upholstery supplies, commercial paper, printing and binding supplies, and office equipment and supplies. Goods on the street: Temporary stalls retailing fashion items, kitchenware, small appliances, home décor, succulent fruits and toys line up the street. On the northbound side of Juan Luna (going to Moriones and Tondo), cellphone, DVD and gadget vendors line the street in front of the old CKS Shopping Center (also closed). Details worth noting: The street is often muddy and slippery, even during the summer, because of the wet market. If you’re not buying any fresh produce, you may opt to stay on the drier side of the street going to Binondo. Banks and pawnshops can be found on the northbound side going to Moriones.